MetaQuotes Software announced that MetaTrader 5 build 1325 now supports a hedging option and a strategy tester with real ticks. Hedging allows traders to have several positions with the same symbol, even going in opposite directions. This new system is similar to the one used in MetaTrader 4, but traders will be able to enjoy all of the advantages of the fifth version of the platform - filling orders using multiple offers or with partial fulfilment, multi-currencies and tester with support for the MQL5 Cloud Network, and more. In addition, there is a new type of order - "Close By" for hedging accounts - closing a position through an opposite order. This order allows you to close two positions in opposite directions, if the opposite positions are not with the same number of lots, one of the two will remain open and its volume will be equal to the difference of lots between the two positions. The latest version of MT5 also offers greater opportunities to transfer MetaTrader 4 accounts. Brokers can automatically transfer MT4 accounts to MT5 accounts along with all open and pending positions and the complete trading history. A chat room has been added. 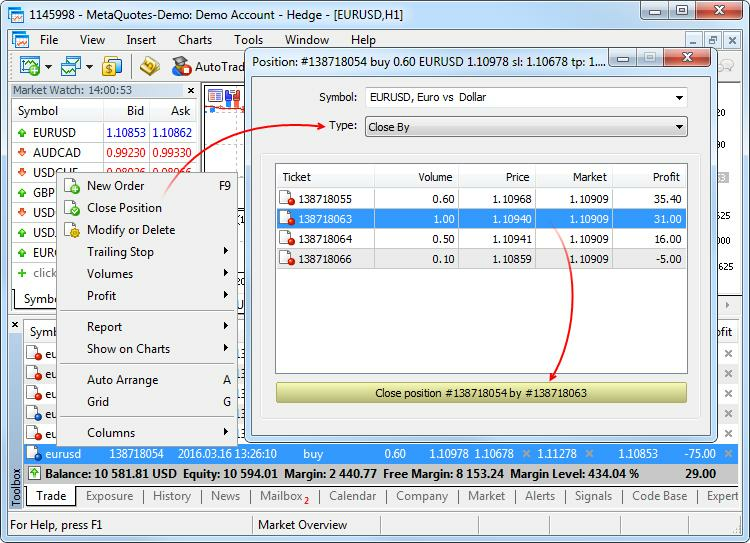 Traders can communicate with friends and colleagues within the MQL5 community. To start communicating, you simply connect to your account directly from the chat window or via the platform settings: Tools Options Community. The dialog box to create a demo account has been simplified and hedging accounts have been added. Each position has a ticket with a unique number. It is usually the ticket of an order used to open the trade unless the ticket is changed by a service operation on the server, for example when swaps are applied, because the position is re-opened. A ticket is automatically assigned to all trades after the terminal is updated. The MetaQuotes team presented traders with the opportunity to test trading robots and technical indicators with a price history that uses real ticks. Strategy testing and optimisation using real ticks enables you to obtain a result that is very close to real market conditions. Instead of using ticks from data in minutes, it is possible to use actual ticks accumulated by a broker with liquidity providers. Read MetaQuotes' complete announcement here.